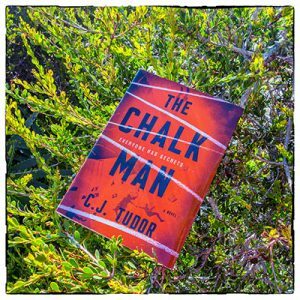 It is very very difficult for me to resist a hyped book and The Chalk Man is supposedly one of the most hyped thrillers of 2018, so naturally I had to read it and find out what all the buzz was about. I was hoping to really enjoy this as most of my Goodreads and Bookstagram friends did, but honestly, I was not impressed. It certainly is a decent and well-written debut, but it failed to awe me. The Chalk Man is a coming of age story that cleverly mixes up secrets and lies with childhood nightmares and the dark, wild imagination of human mind. Twelve year old Eddie and his friends are led to a chopped body in the woods through symbolic chalk messages, a code that they used to communicate just among themselves. Three decades following this traumatic event, the boys have now evolved into middle aged men, settled into their lives when the chalk messages start showing up again. Eddie’s every childhood fear comes rolling back and he and his friends are forced to uncover the thirty old chilling puzzle that had never got solved. The synopsis and plot are both chillingly spooky and alluring, I’ll give it that, however I wish the execution matched as well. For one, the pace is extremely slow, it took me a while to get into the story. Also, the dual storyline of events happening in 1986 and 2016 were more confusing rather than convincing. And what is with the alcohol issue and thriller protagonists these days? Every other thriller I read, I find alcoholism and monotony of life a must in the plot line. Really, is it that necessary for creating a good suspense? I am also quite surprised people are raving about that big twist towards the end, wasn’t it slightly obvious though? Anyhow, there were a few eerie and chilling moments as well and at one point I felt a sprinkle of horror mixed in too, but the overall experience failed to make a lasting impact on me. I wasn’t attached to any of the characters, and the gradual reveals started feeling mundane rather than thrilling. Oh darn! Sorry to hear this one was a miss for you. I can definitely see why. I LOVED it haha!